1. Department of General Surgery & Therapy Center for Peritonealcarcinomatosis, Marien Hospital Herne, Ruhr University Bochum, Germany. 2. Basic Research Laboratory, Department of Surgery, Marien Hospital Herne, Ruhr University Bochum, Germany. 3. Department of Radiation Oncology, Marien Hospital Herne, Ruhr University Bochum, Germany. 4. Department of Hematology & Medical Oncology, Marien Hospital Herne, Ruhr University Bochum, Germany. 5. Department of Neuroanatomy and Molecular Brain Research, Ruhr University Bochum, Germany. * Veria Khosrawipour and Urs Giger-Pabst have equally contributed to this study, and both authors should be considered first author. Background: This study was performed to assess the impact of irradiation on the tissue penetration depth of doxorubicin delivered during Pressurized Intra-Peritoneal Aerosol Chemotherapy (PIPAC). Methods: Fresh post mortem swine peritoneum was cut into 10 proportional sections. Except for 2 control samples, all received irradiation with 1, 2, 7 and 14 Gy, respectively. Four samples received PIPAC 15 minutes after irradiation and 4 other after 24 hours. Doxorubicin was aerosolized in an ex-vivo PIPAC model at 12 mmHg/36°C. In-tissue doxorubicin penetration was measured using fluorescence microscopy on frozen thin sections. Results: Doxorubicin penetration after PIPAC (15 minutes after irradiation) was 476 ± 74 µm for the control sample, 450 ± 45µm after 1 Gy (p > 0.05), 438 ± 29 µm after 2 Gy (p > 0.05), 396 ± 32 µm after 7 Gy (p = 0.005) and 284 ± 57 after 14 Gy irradiation (p < 0.001). The doxorubicin penetration after PIPAC (24 hours after irradiation) was 428 ± 77 µm for the control sample, 393 ± 41 µm after 1 Gy (p > 0.05), 379 ± 56 µm after 2 Gy (p > 0.05), 352 ± 53 µm after 7 Gy (p = 0.008) and 345 ± 53 after 14 Gy irradiation (p = 0.001). Conclusions: Higher (fractional) radiation dose might reduce the tissue penetration depth of doxorubicin in our ex-vivo model. However, irradiation with lower (fractional) radiation dose does not affect the tissue penetration negatively. Further studies are warranted to investigate if irradiation can be used safely as chemopotenting agent for patients with peritoneal metastases treated with PIPAC. Keywords: ex-vivo, penetration, Pressurized Intra-Peritoneal Aerosol Chemotherapy (PIPAC), peritoneal carcinomatosis, radiotherapy. Peritoneal carcinomatosis (PC) is a common manifestation of advanced digestive-tract, mesothelioma and gynecological cancers. Patients with PC of non-gynecological malignancies have a poor prognosis with an estimated median survival of 6 months, depending on their initial Peritoneal Cancer Index (PCI) stage [1-2]. Intra-Peritoneal Aerosol Chemotherapy (PIPAC) is a new approach for intra-peritoneal chemotherapy (IPC). Using a micropump, the drug containing solution is delivered into the abdominal cavity in the shape of micro droplets within a 12 mmHg “therapeutic capnoperitoneum” [3-4]. Penetration depth of cytostatics after PIPAC has been reported to be 300 to 600 µm deep with tissue concentration of 0.03 - 4.1 µmol/g [3-4]. In addition to patients' characteristics and extent of the macroscopic and microscopic disease, tissue penetration depth, distribution and concentration of the cytotoxic agent are factors, which might affect the result of the IPC [4-17]. In spite of improvements in the results of the treatment after IPC, outcomes of the patients with PC remain poor. Thus, a multidisciplinary approach is necessary for the management of PC. Low dose irradiation might enhance the sensitivity of peritoneal cancer tumor cells to cytotoxic agents [18-19]. Theoretically, radiation might have a chemo-sensitizing effect and lead to higher tumor cell kill after PIPAC, provided that irradiation does not negatively impact the tissue penetration depth or tissue concentration of cytotoxic agent. This study was performed to assess the impact of irradiation on penetration depth of PIPAC. Since the experiments were performed in an ex-vivo model on commercially available tissue samples no approval of the local board on animal care was required. Fresh post mortem swine peritoneum was cut into 10 proportional samples (3x3x0.5 cm). Thirty minutes postmortem, except for 2 control samples, all received radiotherapy with 1, 2, 7 and 14 Gy. Four samples were treated with PIPAC 15 minutes after and 4 other samples received PIPAC 24 hours after irradiation. These were kept in a sterile container at 100% humidity for 24 hours at 4°C, to slow down the tissue degradation. The samples were irradiated using a 6-MV photon beam delivered by an Elekta Synergy linear accelerator (Elekta Oncology Systems, Stockholm, Sweden). Doxorubicin was aerosolized in an ex-vivo PIPAC model at 12 mmHg C02 at 36 °C. In the center of the top cover of the PIPAC chamber, a PIPAC micro-pump was installed at a distance of 8 cm to the bottom. Tissue specimens were placed in the middle of the bottom of the plastic box. 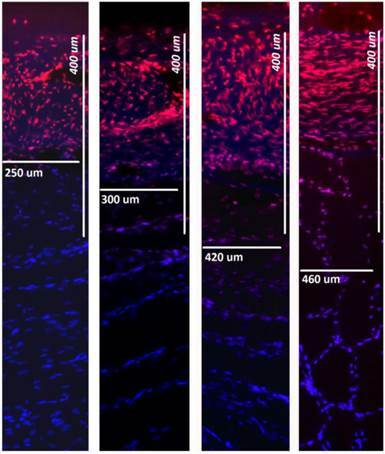 In-tissue doxorubicin penetration was measured using fluorescence microscopy on frozen thin sections. All experiments were repeated at least 3 times (A total of 30 samples, 6 control samples, 12 samples treated with PIPAC 15 minutes after irradiation and 12 samples treated with PIPAC 24 hours after irradiation). The ex-vivo PIPAC model was previously described . Briefly, a commercially hermetic sealable plastic box with a total volume of 3.5 liter, mimicking the abdominal cavity, was used. In the center of the top cover of the plastic box, a 10 and 5 mm trocar (Kii®Balloon Blunt Tip System, Applied Medical, Rancho Santa Margarita, CA, USA) were placed. Using two trocars, the nozzle of the micropump (MIP®, Reger Medizintechnik, Rottweil, Germany) and a temperature/humidity sensor (XA 1000, Lufft Mess- und Regeltechnik GmbH, Fellbach, Germany) probe were introduced. The plastic box was situated in a water bath (Typ 3043, Köttermann, Häningsen, Germany) and kept at constant temperature of 36° degrees Celsius during the whole procedure (Figure 1). 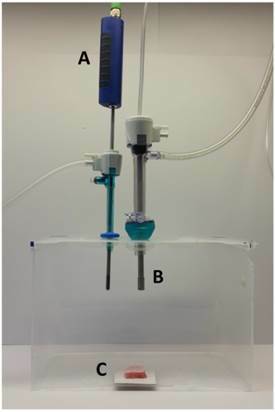 Laparoscopy-like ex vivo experiment with fresh swine peritoneum to investigate the spatial distribution pattern of aerosolized doxorubicin during pressurized intraperitoneal aerosol chemotherapy therapy. A: Temperature and humidity probe. B: Micropump. C: Peritoneum of the swine. The tissue specimen of peritoneum (from German land race pigs), each measuring 3.0 x 3.0 x 0.5 cm, were placed at the bottom of the plastic box in direct extension of the axis of the micropump nozzle in the core of the aerosol jet. The distance between the nozzle of the MIP® and the bottom of the plastic box was eight cm. The plastic box was then tightly sealed and a constant CO2 capnoperitoneum of 12 mm Hg (Olympus UHI-3, Olympus medical life science and industrial divisions, Olympus Australia, Notting Hill, Australia) was applied throughout the whole PIPAC procedure. 3 mg Doxorubicin (Doxorubicin hydrochlorid, purchased from Teva® Pharmachemie B.V., Haarlem, Netherlands), was diluted in 50 ml NaCl 0.9% at room temperature (23°C) was aerosolized with a flow rate of 30 ml/min. After the aerosol phase, the tissue specimens were exposed for another 30 minutes to aerosolized doxorubicin (exposure phase). The procedure was repeated three times. All tissue samples were rinsed with sterile NaCl 0.9% solution in order to eliminate superficial cytostatics and immediately frozen in liquid nitrogen. Cryo sections (10 µm) were prepared from 10 different areas of each specimen. Sections were mounted with VectaShield containing 1.5 µg/ml 4',6-diamidino-2-phenylindole (DAPI) to stain nuclei. Penetration depth of doxorubicin was monitored using a Leica TCS SP8 confocal laser scanning microscope. The distance between the luminal surface and the innermost positive staining for doxorubicin accumulation was measured and reported in micrometers. Experiments were independently performed three times. A total of ten tissue sections per tissue sample were subjected to doxorubicin penetration measurement. The statistical analyses were performed using Sigma Plot 12 (Systat Software Inc., California, USA). The Kruskal-Wallis One Way Analysis of Variance on Ranks was used to compare independent groups. A significant p- value was considered in case of p < 0.01. Immediately after the start of the aerosol phase, the humidity reached 100% and remained constant during the whole procedure. However, the temperature in the plastic box dropped to 34°C at the end of the aerosol phase and climbed to 36°C early during the exposure phase and then remained stable until the end of the experiments. At the end of the PIPAC procedure the tissue specimens were taken out from the plastic box and microscopic evaluation was performed. The doxorubicin penetration after PIPAC (15 minutes after irradiation) was 476 ± 74µm for the control sample without irradiation, 450 ± 45µm after 1 Gy (p>0.05), 438 ± 29µm after 2 Gy (p>0.05), 396 ± 32µm after 7Gy (p = 0.005) and 284 ± 57 after 14Gy irradiation (p< 0.001). Doxorubicin penetration after PIPAC (24 hours after irradiation) was 428 ± 77µm for the control sample without irradiation, 393 ± 41µm after 1 Gy (p>0.05), 379 ± 56µm after 2 Gy (p>0.05), 352 ± 53µm after 7Gy (p = 0.008) and 345 ± 53 after 14Gy irradiation (p= 0.001) (Figure 2-4). Tissue penetration depth of doxorubicin after irradiation followed by PIPAC after 15 minutes (top) and PIPAC after 24 hours (down). 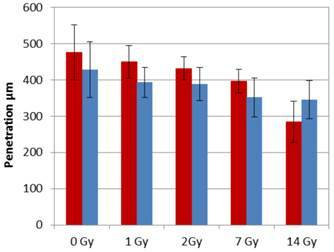 X-axis: tissue specimens in the ex-vivo PIPAC model treated right after radiation with 0, 1, 2, 7, and 14 Gy. Y-axis: Penetration depth in µm. RT: radiotherapy. Fluorescence microscopic analysis of penetration depth of doxorubicin into fresh peritoneal tissue samples. Nuclei (blue) were stained with 4',6-diamidino-2-phenylindole (DAPI). Right side to left: 0, 1, 7, 14 Gy. Comparison of penetration depth between PIPAC 15min after irradiation (red) and PIPAC 24 hours after irradiation (blue). IPC delivered as a pressurized aerosol has been introduced as a new and innovative approach to improve the treatment of advanced PC. Animal experiments performed ex-vivo demonstrated that the infiltration of doxorubicin can be up to 500 - 600 µm in to the peritoneal fatty tissue [4, 20]. In order to conceive a clinical study for chemosensitizing radiotherapy before PIPAC we examined the effect of radiation on tissue penetration prior to PIPAC. The doxorubicin penetration was significantly reduced with higher radiation doses, especially after 14Gy. 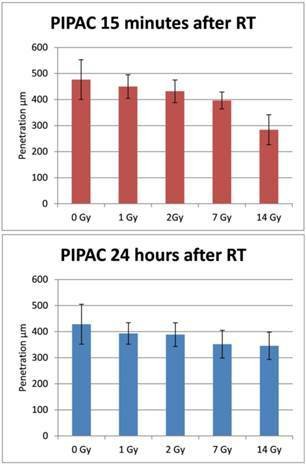 Interestingly, the effect of irradiation with 14 Gy on drug penetration was lower if the PIPAC was performed 24 h after irradiation compared to PIPAC 15 minutes after irradiation. The radiobiological mechanisms of this phenomenon are not addressed at the time. However, the biologic effective dose [BED = nd (1 +d/ α/β)]  in peritoneal tissue (α/β=3) after one fraction of 14 Gy is 79,33Gy. Thus, the DNA damage at 14 Gy is more pronounceable at this dose compared to lower radiation doses. The increases doxorubicin penetration after 24 h post-irradiation is probably due to the (still functioning) repair mechanisms, which lead to some normalization of tissue structure and higher doxorubicin uptake in the cells. However, the low radiation dose did not show any significant reduction of doxorubicin penetration. To our knowledge, this is the first study that reports the effect of irradiation on postmortem swine peritoneum in combination with PIPAC. Furthermore, this is also the first study that uses postmortem peritoneal tissue for radiobiological analysis and reports an influence of radiation on the peritoneal tissue penetration. However, the biological mechanisms underlying principles of the observed and radiation-induced changes are currently unclear. Moreover, it is known that depending on the tissue type, postmortem changes most likely include metabolic, physical and structural as well as biochemical changes . These alterations, if additionally affected by the exposure to ionizing radiation, may influence the ability of the applied Doxorubicin aerosol to penetrate into the investigated postmortem peritoneal tissue. Detailed studies on the processes that underline the observed changes in tissue penetration due to radiation exposure of postmortem tissue are currently designed. The results of our study should be interpreted with caution. Firstly, our experiments were performed in an ex-vivo postmortem model. Thus, although peritoneum is not a shock organ like heart, brain or liver, its response to irradiation in a living organism with regular blood circulation might be totally different. Secondly, clinical data about efficacy and toxicity of chemopotenting radiotherapy for the systemic treatment of peritoneal cancer is rare, but in fact there is no data available on chemopotenting radiotherapy prior to or after IPC. Nevertheless, the described findings might have important implications with respect to the practice of PIPAC therapy. Higher (fractional) radiation dose might reduce the penetration depth of doxorubicin in our ex-vivo model. However, irradiation with lower (fractional) radiation dose does not affect the tissue penetration negatively. Further experimental ex-vivo and in-vivo as well as clinical studies are warranted to investigate if irradiation can be used as chemopotenting agent for patients with peritoneal metastases treated with PIPAC without reducing the penetration depth of cytotoxic agent or increasing the toxicity. Veria Khosrawipour: Study design, laboratory analysis, data acquisition and drafting of the manuscript. Urs Giger-Pabst: Study design, supervision of the study, data interpretation, drafting and critical revision for important intellectual content of the manuscript. David Diaz-Carballo: Supervision of the experiments, statistical analysis, data interpretation and manuscript drafting. Irenäus Anton Adamietz: Critical revision for important intellectual content of the manuscript. Jürgen Zieren: Drafting and critical revision for important intellectual content of the manuscript. Khashayar Fakhrian: Supervision of the study, drafting and critical revision for important intellectual content of the manuscript. This study was financed by institutional funds. The authors have no conflicts of interest or financial ties to disclose. Corresponding author: Khashayar Fakhrian, Department of Radiation Oncology, Marien Hospital Herne, Ruhr-University Bochum, Hölkeskampring 40, 44625 Herne, Germany. Tel: + 49(0) 2323 499 1531 Fax: + 49(0) 2323 499 3306 Email: khfmedcom.